Thanks to four simple tools farmers in Ethiopia are protecting their livelihoods against climate change. For many farmers their harvest is their only source of food and income. This means that without reserves a failed harvest can cause families go hungry, children to drop out of school and deeper levels of poverty. The R4 Rural Resilience initiative tackles this by helping families to manage their risks from harvest to harvest. Not only does this empower farmers but it also just makes sense; it costs less to manage risks than it does to provide relief in a crisis. As climate change makes the weather more unpredictable, delaying rains and creating droughts, farmers’ livelihoods are subject to more risk. The R4 initiative helps farmers to adapt to climate change using four simple tools: weather insurance for their crops, access to credit, support to create savings and environmental rehabilitation projects such as watershed restoration. These simple steps provide farmers with back up sources of income through insurance, savings and small businesses which they can rely on if a harvest fails. It supports families and communities so that they start businesses, invest in their farming and that they, and their families, can cope when their crops fail. 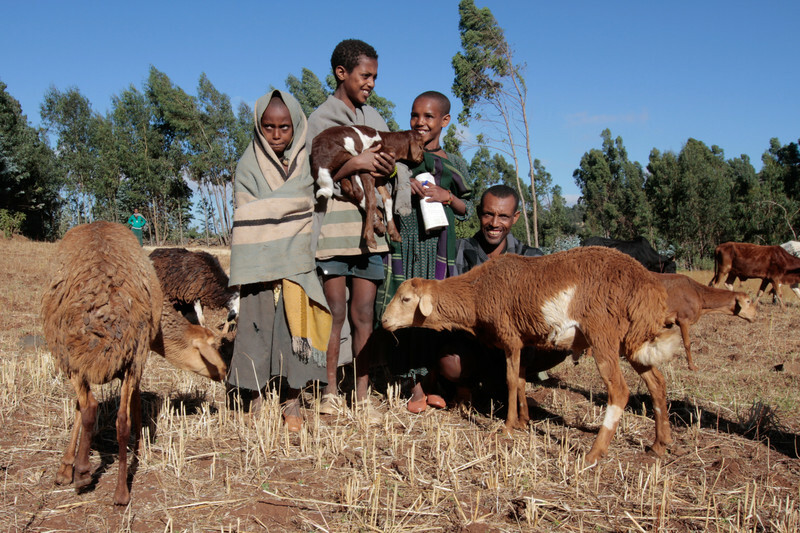 R4 participant Getie Adugna with his three children and goats in Michael Debir village, Ethiopia. The R4 Rural Resilience initiative is a strategic partnership between Oxfam America, the United Nations World Food Program (WFP) and SwissRe, a Swiss reinsurance company. It was initiated in 2011 to respond to the challenges faced by food-insecure communities enduring increasingly frequent and intense climate disasters and other shocks. 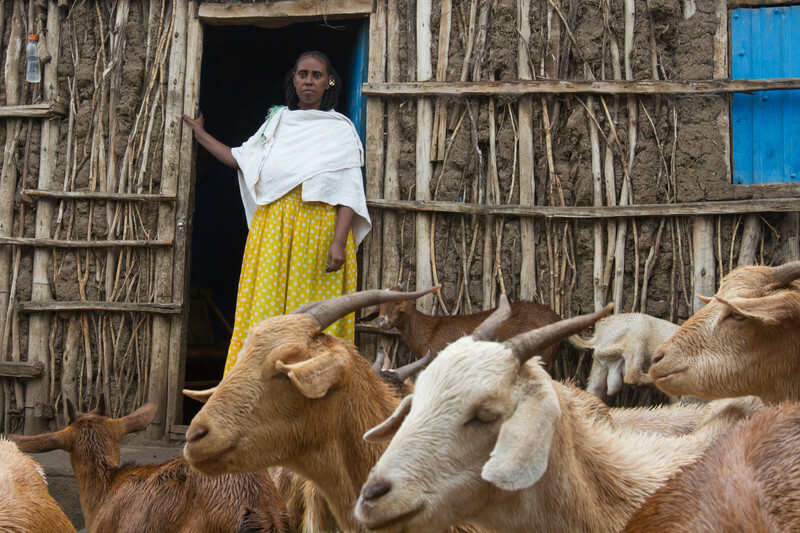 In 2014 the program reached more than 26,000 farmers, including extending weather insurance to 24,143 farmers in Ethiopia. 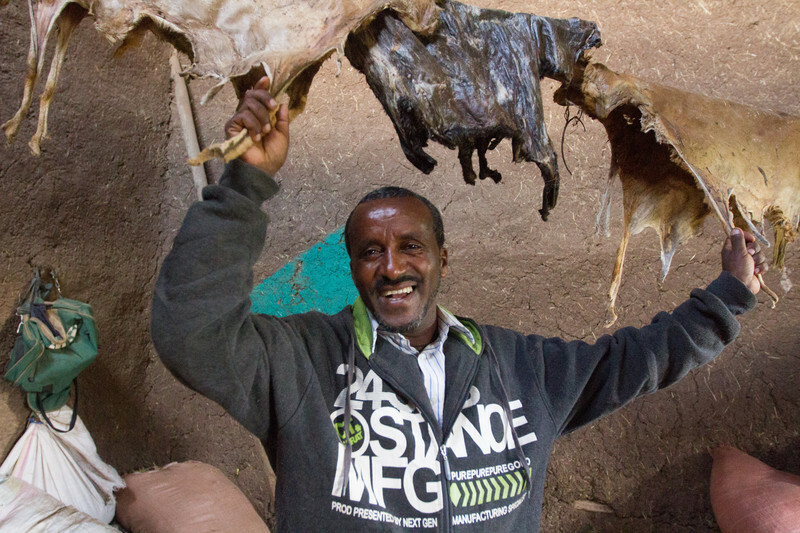 Mulata Atsbeha from the village of Hade Alga in Ethiopia, trades in goats’ skins as well as raising pigs to help support his family. The R4 project encourages farmers to save money to provide more stability in difficult times as well as improving access to loans so that they can invest in their work. Setie Meshesha, a local farmer stand in the community seed multiplication site where wheat is growing in Michael Debir. The Rural Resilience Initiative also ensures that farmers have insurance which provides them with compensation for their crops when rain fails to fall. Originally called HARITA, the program started in Trigray, Ethiopia, with one of the founding members, REST. It offered weather insurance for 200 households which would usually be considered too poor to afford it. Farmers can, however, pay for their insurance through labor. They work on local community projects, like the seed multiplication site in Michael Debir, which improve local agriculture. 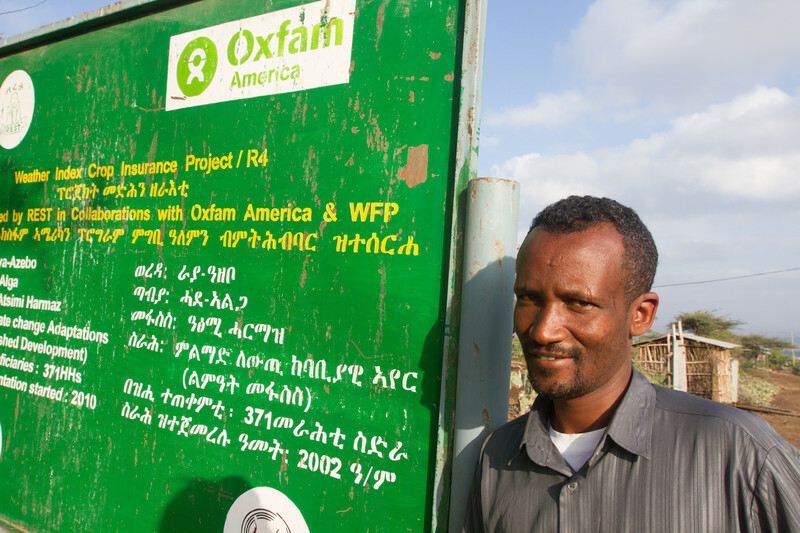 REST coordinator Alem Gidena works with Oxfam on the R4 program in Hade Alga. Other community projects help reduce the impact of natural disasters and helps people adapt to climate change such as field irrigation projects and tree planting. By offering their labor in turn for community work the farmers can protect their future. Under R4 farmers can grow their saving, invest in more drought-resilient crops and launch small businesses which will help to ensure their children’s education and feed their families. Askal Teklay stands with her goats. Using a loan which she got from R4 she originally bought five goats, they have quickly multiplied. 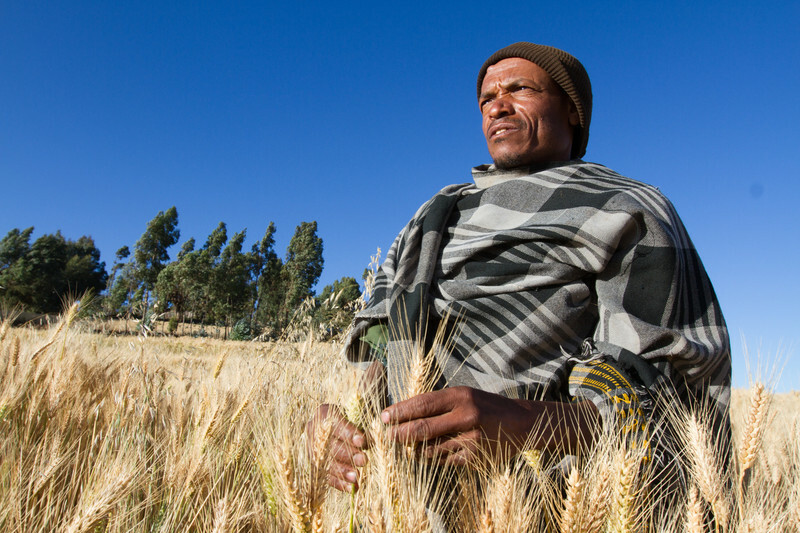 Drought in Ethiopia in 2015 have caused many poor harvests and millions of people are relying on food aid but through programs like R4 we can help farmers prepare for tough times, stay self-reliant and help their communities. Climate change and rural women in Latin America: Five proposals. In Cambodia, recurrent drought periods and floods have become a major concern and a big challenge for many farmers. With support from a local organization funded by Oxfam, Mrs. Sao Khea, a Cambodian farmer learned about how to overcome these challenges and minimize the risks caused by climate change. Ethiopia is one of Africa’s poorest nations with half of its 77 million people currently living below the poverty line and its level of child malnutrition is the highest in the world. Oxfam focuses on sustainable livelihoods, water and sanitation, agriculture, climate research, gender and humanitarian issues.